Time was, pre-Internet, if you wanted to comment on an article in a publication (be it magazine, newspaper or comic book), you had to write or type it out on what we used to call “paper,” fold the letter, place it in and envelope, attach a stamp and toss that puppy in the mailbox, hoping that the editor would see fit to publish your thoughts either rebutting or endorsing the impetus. While modern technology has made the effort far more, well, effortless, the whole business of getting worked up over something you read is a timeless tradition, both honored and dismissed. This is, of course, something I have done a handful of times in my geeky life. The brilliant comedian Paul F. Tompkins caps off his 2007 album, IMPERSONAL with a bit entitled, “Letters to Magazines.” In said piece, Tompkins points out the inherent silliness of penning glowing endorsements to periodicals, particularly the pop culture pabulum known as ENTERTAINMENT WEEKLY. Regarding your statement wondering who would argue that Steven Spielberg is the greatest filmmaker in history: I’ll take that dare. Spielberg’s short-sighted philosophy of a simplistic black-or-white morality works fine in the context of a cartoon like RAIDERS OF THE LOST ARK, but badly undermines the gray complexity of human behavior in more serious films like SCHINDLER’S LIST and AMISTAD. Furthermore, his cloying sentimentality (first displayed in ET, a film that has not aged well) can at times evoke the emotional depth of a greeting card. Spielberg—perhaps even more than George Lucas, as Steven’s taken seriously—is the epitome of the shift from the explosive auteurism of 70s cinema to the glossy sheen of the modern blockbuster (even SAVING PRIVATE RYAN was only visually impressive). Forget Welles, Hitchcock and Hawks, Steven Spielberg isn’t even in the same league as David Fincher, Wes Anderson or (especially) Christopher Nolan, three directors capable of producing crowd pleasing cinema with a real emotional richness. Hell, THE DARK KNIGHT had more to say about human nature than THE COLOR PURPLE. If you ask me (and you kinda did), Spielberg peaked with JAWS, his only true masterpiece. I was not shocked that the letter wasn’t published (Come to think of it, they’ve never printed any of my letters), and it’s not even a very original thought. 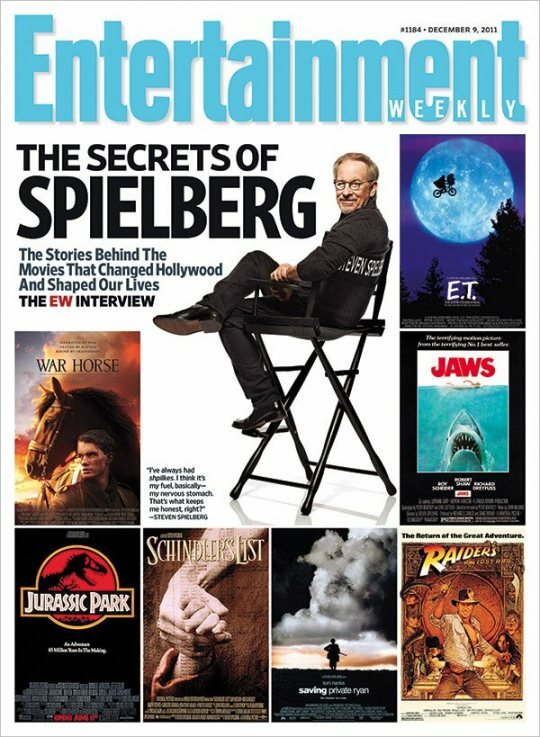 Hell, entire books have been published laying the blame for the state of modern mainstream cinema at the doorsteps of Lucas and Spielberg. But for America’s pre-eminent entertainment magazine (such as it is) to make such a definitive declaration just pissed me off. And, thanks to the democratizing power of the Interwebs, I have now gotten that off my chest. Take THAT, Jess Cagle! And I hope Paul F. Tompkins approves.